Located in central London, Camden is super accessible by public transport from both in and outside of London. 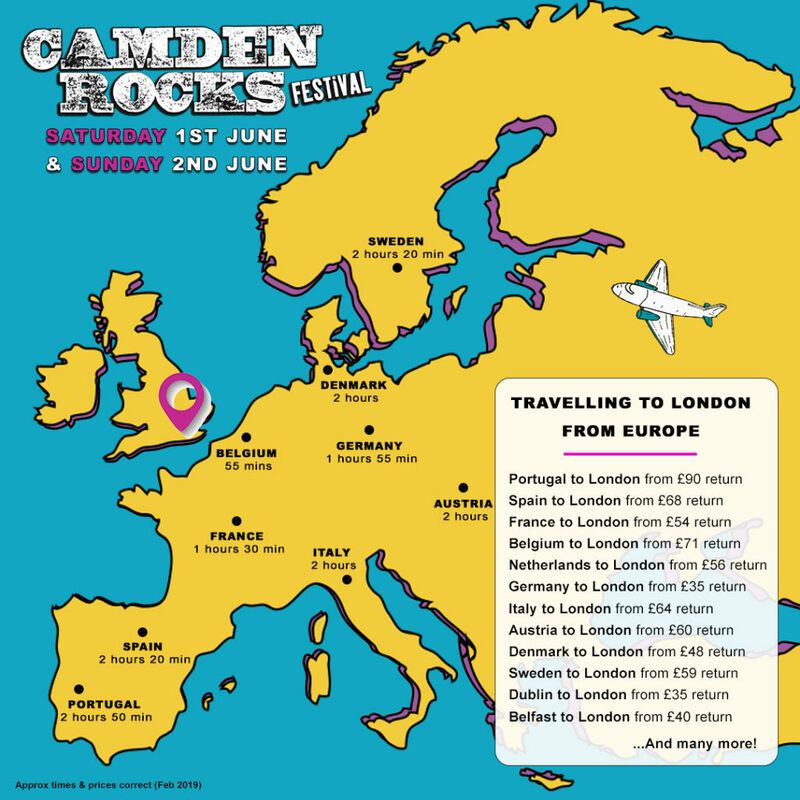 The most central point of the festival to plan your route, is Camden Town Underground Station (NW1 0NE). 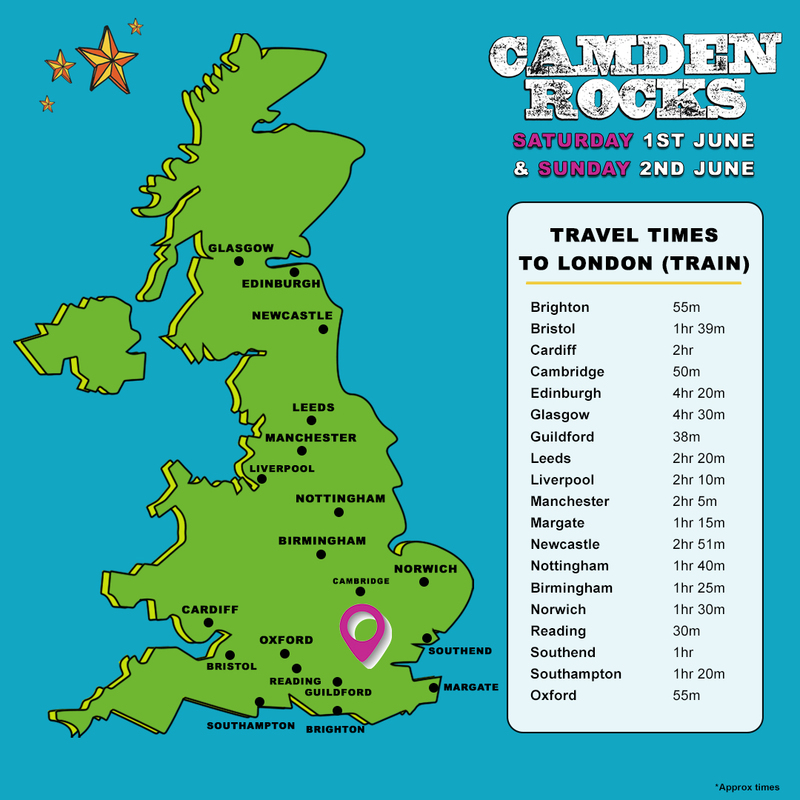 Most major London Rail Stations are only ten – twenty minutes from Camden, with all Major London Airports also offering quick and easy connections (see further info below). For those travelling from within London, plan your journey using Transport for London’s journey planner here. The Eurostar Terminal gets in to St Pancras Station in Kings Cross. This only one stop (five minutes) on the underground from Camden, or a short taxi ride (five minutes). London Gatwick – catch the train direct from Gatwick to St Pancras (45 minutes) where you’ll only be one stop from Camden on the underground. London Luton Airport – catch the train direct from Luton Airport Parkway Station to St Pancras International (twenty five minutes), where you’ll only be one stop from Camden on the underground. London Heathrow – catch the Heathrow Express direct to Paddington (fifteen minutes), then the tube on to Camden. Or, for the price of a tube ticket catch the Piccadily Underground line all the way to Kings Cross, where you’ll only be one stop from Camden on the underground. London Stansted Airport – catch the Airport Bus Express to Stratford International (fifty minutes), where you can then catch the overground train to Camden Road Train Station (twenty minutes). More information on the Airport Bus Express service can be found here. London City Airport – catch the DLR train to Bank, where you can change on to the underground and it’s only a short ride (thirteen minutes!) to Camden Town on the Northern Line. London Kings Cross – only one stop away from Camden on the Underground (five minutes). Or a short taxi ride (five minutes) or walk (twenty minutes). St Pancras International (next to Kings Cross Station) – only one stop away from Camden on the Underground (five minutes). Or a short taxi ride (five minutes) or walk (twenty minutes). London Euston – only one stop away from Camden on the Underground (five minutes). Or a short taxi ride (five minutes) or walk (twenty minutes). London Waterloo – direct to Camden by the Underground on the Northern line (fifteen minutes). Other main London stations such as Marylebone, Victoria or Liverpool Street, are all within approx twenty minutes of Camden on the Underground. Camden Town Underground Station can get very busy on a weekend, so you may prefer to travel to Mornington Crescent and walk the 5-10 minutes to the centre of the festival. The Northern Line now operates on a 24 hour tube on Saturdays so you can party into the night and still be able to get home on the tube! ‘Camden Road’ is the London Overground rail station for Camden and is just a five minute walk to Camden Highstreet where the festival takes place. Camden Town is served by numerous bus routes and night buses. Plan your journey here. There’s several docking stations for the Boris Bike Hire scheme in Camden. Check out safe routes and where to collect / dock bikes on the official website. We would not recommend coming to the festival by car. Parking in Camden is not plentiful and are predominantly short term options (4 hour max). All travel information correct at the time of writing. Please check your travel route for planned works and live service updates before you travel.